Today kicked off the 13th Annual Nicky's Week at RA Sushi benefiting St. Jude Children's Research Hospital with a special curated menu where 100% of the proceeds are donated from May 22-28. Ever since my visit to Nobu a few weeks ago, I've been craving some good sashimi and seared tuna, so I definitely wanted to try this spot out and share about this thoughtful fundraiser. Nicky's Week honors the life of Nicholas Mailliard, who lost his battle with pediatric cancer in 2005 at the age of 13. Nicky was the nephew of Rich Howland, one of RA Sushi’s founders. His battle with cancer deeply impacted the RA Sushi family and inspired the annual event benefiting St. Jude. RA Sushi anticipates to raise over $200,000 this year bringing their overall contributions since its inception in 2005 to $2 million. Cash donations are also accepted. Dallas locations include: Southlake, Addison, and Plano. My sister and I visited the RA Sushi location in Addison which is an excellent location for busy business professionals in the area who want a solid lunch, happy hour or girls' night out/date night dinner. It's a pretty casual restaurant that still has the swank of an upscale spot. There's even a fire pit on the patio that would be amazing to sip cocktails by in the evening. All of the menu items we had the opportunity to taste were delicious and we thoroughly enjoyed each dish. Steamed soybeans dusted with salt. We really didn't dig into these because we started with the Pork Gyoza and completely lost ourselves in the rest of the delicious dishes. By the time we finished and full from everything else, we realized it was barely touched! Beginner's Tip: All you have to do is pop the beans out and eat them -- not the pod. RA Sushi's license did not allow for cocktails to contain alcohol for our media tasting, but the fruity flavors were all still there and I'm sure they're even more fantastic with it. We had the mocktail versions! Sea Monkey has flavors of Skyy Raspberry Vodka, Bols Black Raspberry Liqueur, pineapple and cranberry juice. Dragon Bite uses exotic flavors of Bacardi Dragonberry, Absolut Citron, strawberry puree, lemon juice, Japanese yuzu and a splash of soda. I could probably eat potstickers all day long (they're my fave), so I started with the Pork Gyoza which are sautéed Asian potstickers served with ponzu sauce. They were pure perfection on a plate. I'm very new to sashimi, but I recently had some and have been wanting to try more. The Garlic Ponzu Yellowtail was thinly sliced yellowtail with garlic ponzu sauce and scallions served with organic micro greens. If you're not familiar with nigiri, you may have actually used its emoji without knowing! 🍣 Nigiri is a small oval of rice topped with a thin slice of raw fish or seafood. 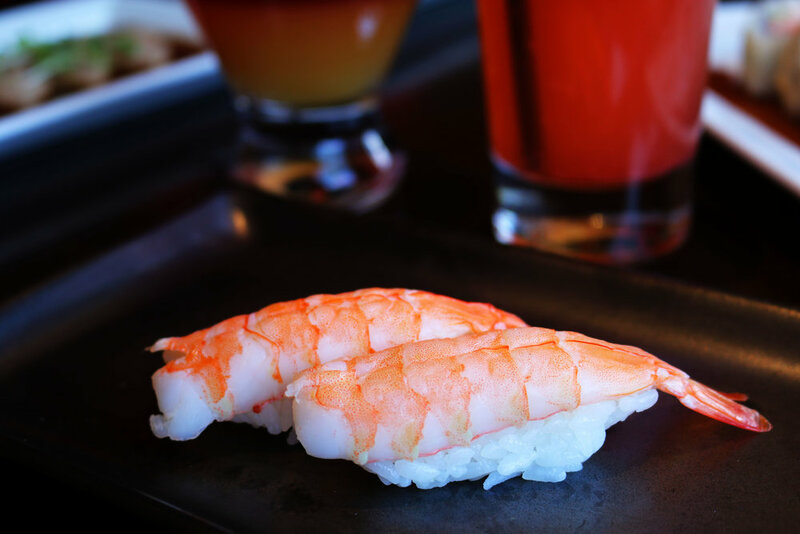 There are tons of nigiri options on RA Sushi's menu, but for Nicky's Week, you'll be able to indulge in the shrimp nigiri. Poke bowls have been super popular amongst the Instagram world lately, so I was excited to see it on the menu. I let my sister dig into this one. The Chirashi Poke is tossed with tuna, salmon, yellowtail and shrimp with cucumber, avocado and green onion in poke sauce, topped with seaweed salad and sesame seeds. It's served with two sauces that my sister actually described as "a little spicy" (so probably mild) with steamed rice. If you're looking for something really fun with firework flavors, you have to try the "RA"CKIN Shrimp Tacos. My sister wasn't a huge fan of them, but I was...so more for me! I loved the sweetness of the Asian cole slaw at the base of the crispy gyoza shell with the flavors of shrimp, ginger teriyaki and guacamole. It was divine! No, that's not ice cream! It's wasabi. I clearly wasn't fast enough for the Tootsy Maki because I'm pretty sure my sister had more from the dish than I did...however, it was delicious. It was a crab mix, shrimp and cucumber rolled and topped with crispy tempura bits. The sauce you see under it is sweet eel sauce which gave the sushi a fabulous flavor. Definitely a top menu choice! Unfortunately, I won't be able to make it back to the restaurant again before the end of Nicky's Week, but I have definitely found a new restaurant with three convenient locations for me: Addison, Southlake, and Plano. I'm excited to return very soon though! I've been dying to find a restaurant nearby with good sashimi and seared tuna, and RA Sushi has both at affordable prices. Visit my foodie page @Gastronomic Grub for more/future photos from RA Sushi!